A ranger/adventurer in her early 20's, raised out in a sort of nature commune by a woman who claimed to have found her abandoned in the woods as an infant. Shortly before the story (i.e. game) started, the woman fell ill and passed away, but not before revealing that the girl's parents were the benevolent king and queen of a kingdom that befell a terrible coup when she was just about a year old. The queen passed her daughter off to the royal court mage/adviser shortly before dying herself, to keep safe someplace far away until the girl was old enough to come and reclaim her kingdom and restore order. She was going to be told this upon reaching a certain age, but the death of her guardian sort of threw a wrench into all that and had to be done early. She now wanders around trying to figure out how to do that, and if she even wants/is capable to, seeing as how she up until that point had made quite a living as an adventurer. 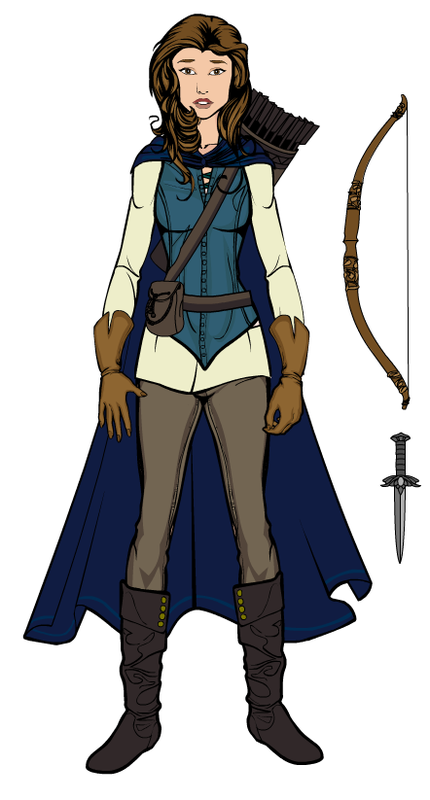 She's quite handy with a bow and is good at spotting/disarming traps. Haven't fully dedicated to a name yet, but the one I keep coming back to is Eirene: Greek for "peace."